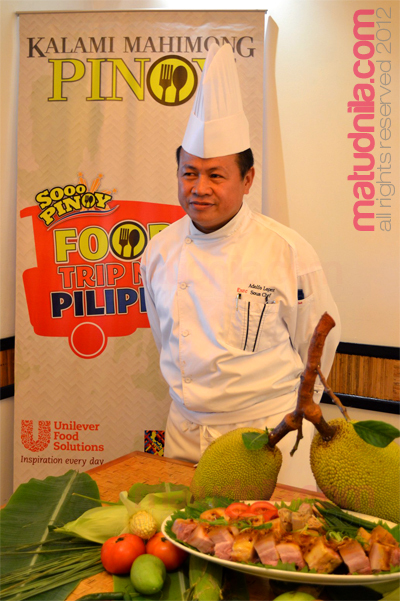 Sooo Pinoy Food Trip project is spearheaded by Uniliver Food Solutions with goals to boost Pinoy's appetite for Filipino food. The second stop for Sooo Pinoy Food Trip Day in Cebu is Shangri-la Resort and Spa Mactan Tide Restaurant. Shangri-la Mactan's Tide Restaurant is prime buffet table destination in the resort and in the Island. Shanri-la Mactan's Tide Restaurant Sous Chef Adolfo Lopez prepared to Sooo Pinoy a traditional Ilonggo dish that is offered mostly on speacial family occasions like Barrio Fiesta, birthdays or weddings. Shangri-la Mactan's Pork Lau-ya, a boiled porked belly in local vegetables and spices is also a all time family favorite dish cook straight from Chef's Adolfo's mother recipe. To give you idea on how it taste, Tides Restaurant Pork Lau-ya is similar to Sinigang with sabaw or soup but only uses green mango to enhance its sour flavor. 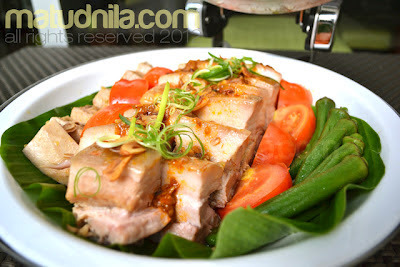 In Ilo-ilo, Pork Lau-ya is slightly at par with KBL or staple Kadios Baboy Langka. The flavour of Pork Lau-ya is due to overnight marinade in salt, pepper and sugar before simmered toogether with local vegetable ingredients and other spices. Pork Lau-ya is expected to join with other Traditional Filipino dishes in Shangri-la Mactan's Filipino Nights that would be slated every Thursday starting May. Chef Adolfo with 16 years experience in and out of the country cross culture culinary with his latest offering the Pork Lau-ya. 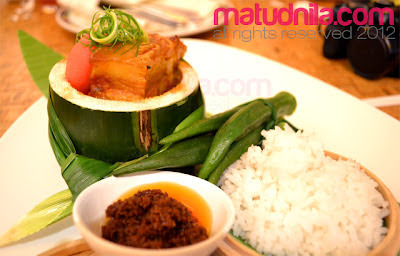 Bringing traditional Ilonggo dish to Cebuanos at Shangri-la Resort and Spa Mactan. 0 comments: on "Sooo Pinoy Food Trip Cebu: Shangrila Mactan Tides Restaurant"